Here's another idea. I'm not fully convinced it's good, but hey, food for thought. Anyway, this one consists of two ideas that are somewhat related. The first idea is based on the observation that most players use squads of mercs that become quasi-fixed over a campaign. This is only natural - you decide what abilities your team should have, and then pick mercs that together fulfil your requirements (and hopefully don't murder themselves immediately). So the idea is to perhaps 'reward' the player if he does so - by giving mercs that are in the same squad for multiple battles boni for just that. As a result, once a squad is set up the player has the incentive to keep that squad intact. I'd advise using battles to count how long team has been together, as battles are the only time these boni would matter anyway. An issuse is: how to we define 'squad'? In the code, 'squad' is just a designation, and we can instantly change it in strategic. It would be more reasonalbe to tie it directly to mercs. As a 'hook' we'd use a designated squadleader (SL) - this doesn't have to correspond to the trait of the same name. So the more battles mercs are in the same squad with the SL, the higher their bonus. The more coherent the squad (no recent additions/leaves), the higher the bonus. So you can still shake up the squad, but the boni will be lowered for a few battles. Doctor: Every time a merc in the squad bandages someone, there is a chance to also heal a small amount of HP isntantly. Heavy weapons: -x% AP to fire heavy weapons. Auto weapons: -x% burst penalty. Stealth: Lower the extra AP cost for stealth movement actions. Bodybuilding: +x% damage resistance, +x% carry strength. Radio Operator: The radio operator's eavesdrop action affects the entire squad. Scout: Instantly uncover any enemy role. Considering every merc has up to 4 traits, this could lead to quite a few possibilities. In that case the 'Squadleader' isn't always a leader though - getting Buzz as a SL sounds like a really sweet deal, when you wouldn't really trust here to lead anything but a death squad (then again, she kinda does, so... win?). The good part of this is that have quite a few optoins, but don't need any skill-tree or whatever. We could also add a bit of game progress relation by limiting how many squad leaders you could have. So, say, we start the game with 0 and get our first one as a 'reward' for completing the Food Quest (thereby signifying that we've taken out first city and have helped the rebels). Another one for liberating 3 cities, or freeing a certain prisoners from a notorious prison... you get the idea. My second idea, then, contains skill-trees. This is based upon the idea that different players have different playstyles. Some people like to turtle up behind militia, others don't. Some like to play stealthy night missions, others just want to see the world burn. We could really argue that everybody can surely tweak the game the way they like it by using the fuckton of options we have, but this is another idea. Another tree might be all about support - better doctor/repair abilities. Another one might be about infiltration - various tweaks that make life as a spy a tad easier. And so on. You would then need skill points for this. Which, again, you could earn by quests. Or various things you do. Get a point for wiping out 1/2 of the queen's initial garrison. Get a point for wounding 3 guys with one bullet. It would be like achievements, but with a point (so not like achievements at all. Achievements are what developers add when they want to stretch content while doing as little work as possible). If we might want to reset these points at some point, gameplay wisdom suggests we would do so at a priest of some sorts. And we actually have one ingame! So the bloke could have something else to do besides getting wasted and ogling young women. As said, not sure how good these ideas are, but hey, still space left in here. @1 I like the idea of semi permanent squads, maybe make it bonus starts at 75% of squad present and goes up. wondering though about the based on SL kinda thing for which boni I was more thinking it might be a morale bonus and maybe some other thing because of them being more co-ordinated and trusting their squad. Sio maybe a bonus against suppression and maybe an effective level boost. Squad bonuses might be interesting, but here really the problem of what constitutes a squad. In reality it should be just people fighting together, as that what happens, while designated squads are very fluid matter especially as soon here more in the sector than fits in single. In those cases it not uncommon for me to reassign people to different squads multiple times during even single combat based purely on tactical situation, while I might consider them all one extended team or two (or more) different teams strategically. So my take on it would be: mercs who was together in previous N battles receive grade N bonus. So newcomers in this battle get none, those two never ever fighting separated receive maxed possible boni. How the boni is determined and what it is, that's whole different question. Skill tries... I was playing with half baked idea about possibility of mercs gaining actual traits on leveling up (or something else of sorts) involving random chance and limited choice from player (while reflecting on things they done and keeping it from going far from existing constraints, what may be the hard part). But this must be something else entirely... or isn't? Nothing to add. Just thought I'd let you all know that I misread the thread title as squad-based pepperoni. I have to admit I'm no fan of bonuses that grow out of nowhere. If there shall be squad bonuses they should be about working well together. Like pheloncab I see them more in the area of morale, suppression protection and situational awareness + communication (penalty for shooting at unseen targets, chance to interrupt, chance of being ambushed). Skill trees - is this about replacing traits? In my opinion we already have quite a lot of different mercs for each play style in the game so people can already select what they need or create a bunch of IMPs with the "perfect" trait layout. Mercs need traits from the start so they can fill their role and it wouldn't make much sense to me if they earned traits by completing a quest. 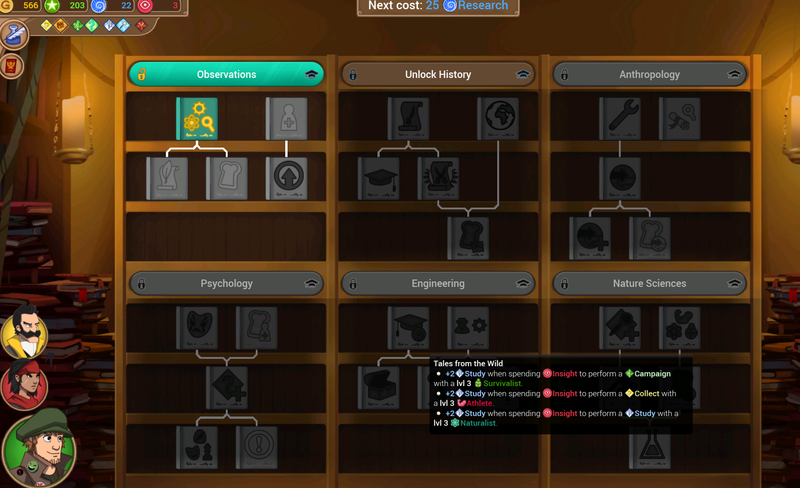 If you want to have a skill tree system on top of the traits I could imagine something that enhances certain aspects of traits that the merc already has. Call it specialization. You'd only be allowed to select one specialization per skill level, so you can either select more CTH or less penalty on auto/burst - not both. Such tree would need to exist for every trait with at least 4 specializations so we can fill at least two skill levels. Again, I wholeheartedly agree completely. I guess my take was the Skill Trees were Strategic in nature not more per merc bonus stuff, So they were points you earned that gave you as the commander extras ... like better militia maybe they get improved health or defense or offense or hit bonus or less dailiy cost, or better recruitment levels. anyways.. thing that don't generally help your mercs directly in combat but help the overall strategic stuff a bit. I don;t use the food/water/drug/poison stuff (too much micromanaging time) but maybe a tree could help with that stuff..
Next Topic: Alternative Music Pack? ?